Some of you may be familiar with Flow Kimonos from my previous review of their hemp gi earlier this year. Flow also has an ultra-light competition gi. The Pro Series 2.0 is made in China, available in black ($144.99) & white ($134.99), has long AND husky sizing and weighs just a little more than 2 iPads. Seriously, this thing weighs nothing. Before this gi my Manto X Pro was the lightest gi I’ve ever had at just under 4.5 pounds. The Pro Series 2.0 is a pound less and for anyone that cuts weight you know just how nice that can be. The biggest change between this gi and the previous iteration is that Jonathon moved all of his production over to China. China is known for higher quality standards and generally speaking better gis. Other gis that I reviewed from China (Datsusara and Lucky Gi) have consistently been of better quality than what I’ve seen out of Pakistan. The jacket is constructed from 420g pearl weave, has grey contrast stitching and is pre-shrunk. The collar is foam filled, ripstop covered and the stitching is even with no obvious defects. There is reinforcement at the armpits, side slits and the base of the gi which is lined in silver cloth tape. The pants are constructed of 8 oz ripstop with reinforced stitching at the seams. To give you a better idea of the weight of the gi the lightest gi (A1) weighs 3lbs and the heaviest (A4) weighs just 3lb 7oz. If you’re looking for a minimalist jacket here you are. There is embroidery on each shoulder, Flow’s logo, ~3in diameter, with “flow kimonos” embroidered under it. “flow kimonos” and “PRO SERIES” is embroidered on the lower right of the skirt. These are all very well done and there are no visible defects. A small lapel patch at the bottom rounds it out. The contrast stitching and color choices do a good job of highlighting the gi instead of the embellishments. The jacket is noticeably thinner than a typical gi and extra material is at a minimum. The Pro Series pants weigh virtually nothing. The back of the waist is slightly off-set to help keep them in place while rolling. There are matching patches on the left and right hip, “PRO SERIES” and “FLOW KIMONOS” respectively. The patches are 1.75” x 7.75”. The only other patch is a small manufacturers ID patch on the left waist. 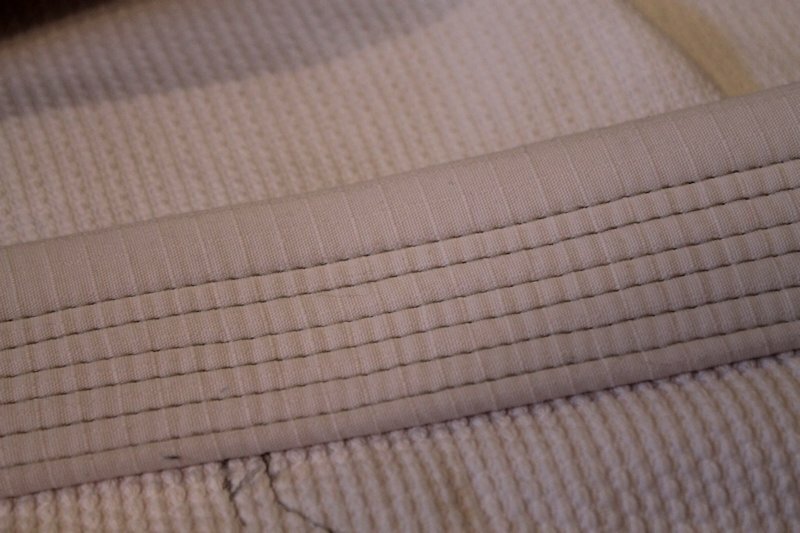 The bottom of the left leg has embroidery, “flow kimonos PRO SERIES”. The embroidery is well done with no obvious defects. The seams are all triple stitched. The pants have knee reinforcements that start at mid-thigh and continue to 11” from the cuff. The cuffs are lined with silver cloth tape. The gi fit me great right out of the bag and was long enough that I was able to dry the jacket once to tighten it up a little bit. The gi is a part of my normal rotation and I wear it at least once a week. The jacket is very light which is appreciated now that it’s getting hot the arms and chest of the jacket are also cut for slimmer athletes. The minimal overlap of the chest keeps the excess gi material to a bare minimum. The pants feel a lot like wearing pajama pants, very comfortable and with full freedom of movement. Ripstop pants always shrink, even when washed on cold and hung dry. These pants haven’t changed since I got them out of the bag. The downside of designing an ultra-light competition style gi is the potential for durability issues. The ripstop covering on the lapel has begun to separate. The pants have worn well but part of me is still a little worried about a material that is this light. I discussed this with Flow and he assured me that he’ll bring this to the attention of the factory that produced the gi and that to his knowledge it’s a one-off. On a side note, I like the gi enough that I’m getting it fixed at a tailor even though I have a dozen other gis. I love that Jonathon moved his operations to China and he did it without jacking up the price. As far as I know this is the least expensive gi that’s made in China. Good guy Flow Kimonos! The last thing I want to point out is that the gi did not shrink at all with cold wash and hanging dry. I did dry the top once to shrink it a little. This is great, especially for a competition gi, because you know what you’re getting and you know it won’t shrink to less than legal dimensions. The Pro Series 2.0 is the lightest gi that I’ve ever worn. It’s very comfortable, looks great and has plenty of room for patches if that’s your thing. There are sizing options for the skinny and the big-boned. You could be a 6 foot featherweight or a 5’10” ultra-heavy and you’ll still be able to find a gi that fits. At $134.99 the gi is well priced and if you’re able to have a competition only gi I recommend it. 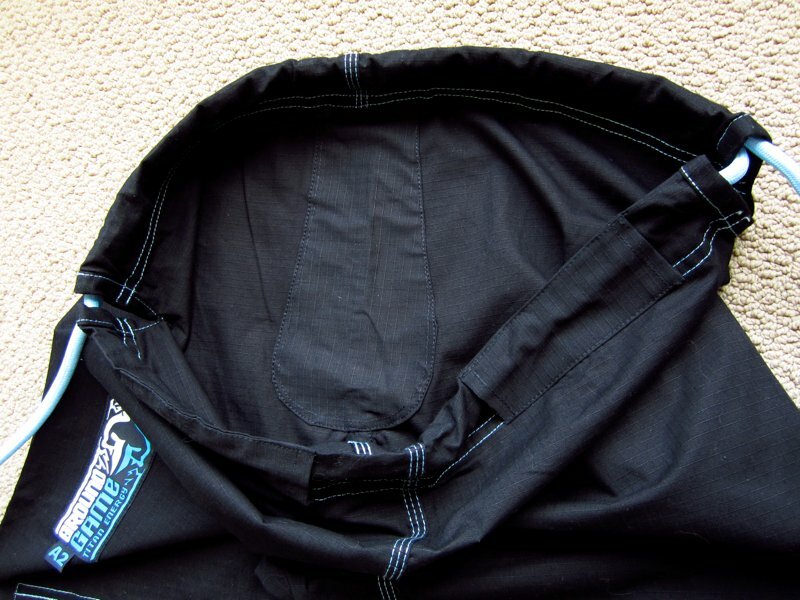 If you’re looking for an everyday gi that will have to stand up to a lot of wear and tear you may want to consider something a little heavier. Be sure to check out Flow Kimono’s website, Facebook, Pinterest and Twitter for more information and product sales.